Apart from the delightful mottled and striated material, which is translucent and, indeed, almost transparent in places, the main appeal of this undecorated bottle lies in its form. The elongated ovoid body of cylindrical shape, tapering downwards toward the foot and upwards toward the neck, is of a unique and immensely satisfying form. When the bottle is seen standing, the recessing of the foot suggests that it has no footrim, which allows the ovoid form to sit very firmly on the ground with great stability and presence. One only has to imagine it sitting on a conventional footrim to see what a change this would make in the overall presence and personality of the bottle. The solid stance of the body is superbly offset by the elegance of the flared neck, which lightens the entire effect and manages to combine a sense of solid strength with elegance and grace. It is also a delight in the hand and the sort of bottle which, once picked up, is difficult to put down again. A bottle of this sort, without decoration from which to derive a sense of regional or period style, could have been made at any of a number of places around the empire over a very considerable period of time. Under high magnification, the surface of this bottle is naturally worn, with a series of totally random, non-mechanical and logical markings suggesting a considerable period of use. The chances are, therefore, that it dates from the mid-Qing period, from perhaps the mid-Qianlong period until the end of the Daoguang, but it could be much earlier or even a little later. The degree of natural wear would seem to rule out the possibility of it being less than a century or so old, particularly since the snuff bottle was used less and less in the twentieth century. The earlier possible date of 1680 is as much provocative as likely. 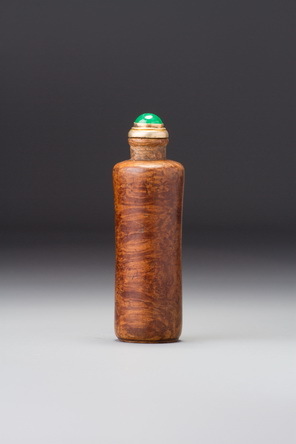 We know that snuff bottles must have been made in reasonable quantities at and around the court from as early as the mid-Kangxi period, when the habit began to catch on in the north of China. Many of these must have been plain, but as yet not a single hardstone bottle can be confidently attributed to the seventeenth century. When we are faced with plain, well-used bottles which have no stylistic evidence for not being early Qing, it is perhaps wise to allow the possibility of a seventeenth-century date, even if it is, in most cases, improbable in fact.